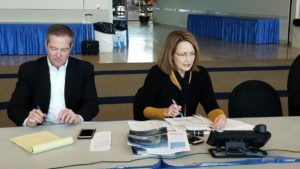 FAIRMONT — Hoping to attract more students and professionals to the cybersecurity field, TechConnect West Virginia unveiled its WV Cybersecurity Workforce Strategic Initiative Tuesday morning. TechConnect West Virginia Executive Director Anne Barth introduces herself to the rest of representatives at the release event for the WV Cybersecurity Workforce Strategic Initiative. Technology Consortium, West Virginia National Guard and West Virginia Forward, focuses on training and employing state residents in the cybersecurity field. Anne Barth, TechConnect West Virginia executive director, said the initiative will take advantage of a growing market to benefit the state’s economy. Barth said cybersecurity is a growing field that state residents need to take advantage of sooner rather than later. “These are where good jobs are in the future, and we want our students to know about it,” she said. “We want workers who might want to migrate to a new career after getting some training to be able to fill the skills gap who might want these jobs. 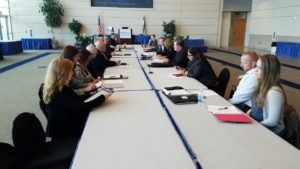 The release of the initiative took place at the Robert H. Mollohan Research Center, with Barth accompanied by representatives from Fairmont State University, West Virginia University, the West Virginia High Technology Foundation and dozens of other organizations from across the region. 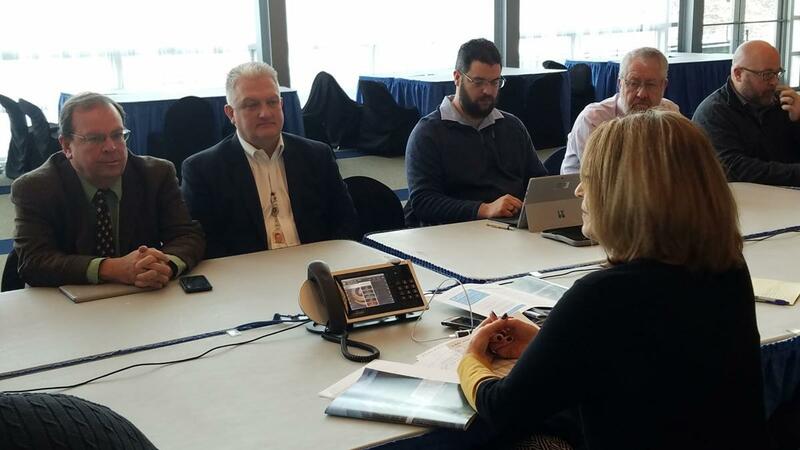 Area officials listen to TechConnect West Virginia Executive Director Anne Barth’s plan to engage more students and young professionals in the cybersecurity field. Jim Estep, president and CEO of the High Technology Foundation, said the initiative fits in perfectly with his goal of diversifying the state’s economy, especially when it comes to attracting even more cybersecurity companies to the region. “What’s key is that we have to have better economic diversification in West Virginia,” Estep said. “That has to include participation in some of the fastest growing economies in the country, and the fastest growing economy is the knowledge sector. Estep said that while some of the jobs are already here, they aren’t being taken advantage of by the state’s workforce. The initiative’s focus on education will better prepare students for the real world upon graduation, giving young professionals the chance to join a good field without leaving the state, he said. “One of the biggest challenges for the state of West Virginia is — and has been — our workforce demographic,” Estep said. “We didn’t do a good enough job of creating opportunities around the state for our educated residents to stay here and work. They left, leaving us with a workforce demographic that’s unbalanced. We’re kind of in the hole, so to speak. Representatives from a variety of North Central West Virginia organizations discuss the future of cybersecurity at the Robert H. Mollohan Research Center. Barth said that with 900 cybersecurity jobs available in West Virginia alone, she hopes everyone at Tuesday’s event left with a plan to make the field more accessible and attractive to the state’s residents. Staff writer John Mark Shaver can be reached at 304-844-8485 or jshaver@theet.com.